Professional features and sound without the cost - with the added flexibility of an added F-attachment. The YSL-448G features beautiful rich tone, easy playability, and a balanced response. 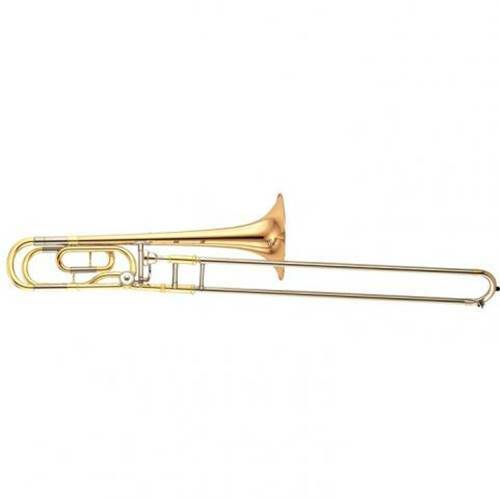 The bore and bell sizes are the same as professional models, and it boasts a handcrafted assembly which you would normally expect only for a top-of-the-line trombone. The 8-1/2" bell is made of gold brass for a warm, rich sound which can fill a concert hall and the intonation is very accurate. The slide action is smooth and the quick response and comfortable playability is consistent in almost any register, at almost any dynamic. The YSL-448G offers a large orchestral bore for powerful sound projection and features Yamaha's original wrap for the F-attachment, which is characterized by a surprisingly open, free-blowing response, and by remarkably smooth valve action.